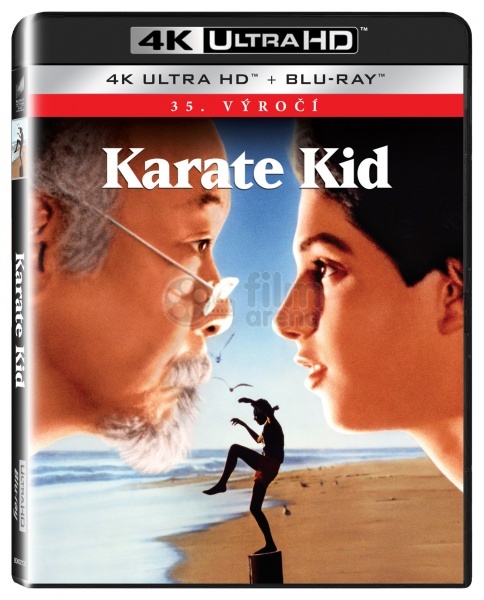 Daniel Larusso (Ralph Macchio) is a teenager who moves from New Jersey to Los Angeles after his widowed mother, Lucille (Randee Heller), gets a new job. Daniel is unhappy at having to move, make new friends and leave his old friends behind, but he promises Lucille he'll do his best to make a new life in California. Daniel quickly makes a new friend, Freddy Fernandez (Israel Juarbe) at the apartment complex. When the faucet at their new apartment is breaks, Daniel goes to see the maintenance man, Kesuke Miyagi (Pat Morita), who is attempting to catch a fly with chopsticks. He seems annoyed at being interrupted but assures he will get to them in due time. Freddy invites Daniel to a beach party where he spots a beautiful blonde named Ali Mills (Elisabeth Shue). As the sun goes down, local troublemaker Johnny Lawrence (William Zabka) and his flunkies, Tommy (Rob Garrison) and Bobby (Ron Thomas), crash the party on their motorcycles. After menacingly circling around their bonfire a few times, Johnny dismounts and argues with Ali, revealed to be his ex-girlfriend. He destroys her stereo, prompting Daniel to stand up to him. Johnny quickly reveals that he knows martial arts, and he easily beats up Daniel, giving him a black eye. Daniel is humiliated and refuses Ali's help when she seems concerned. He attempts to hide the eye injury from Lucille by wearing sunglasses to school, when this fails, he lies and tells her that he fell of his bicycle. Daniel receives further humiliation during the soccer tryouts at his new school, when Bobby slide tackles Daniel, prompting Daniel to tackle him and land a punch to his face, which gets him expelled from the field. Although Daniel has some basic knowledge of martial arts via some YMCA self-defense classes, he decides he needs a refresher. While he exercises, Miyagi comes in to fix the sink and comments on Daniel's attempts to learn from a book. He also inquires how Daniel could fall off a bicycle without sustaining any injuries to his arm. When Daniel meets Lucille for lunch he notices a karate school, the Cobra Kai dojo, across the street from the restaurant, and decides to check it out after Lucille returns to work. The dojo's sensei, an ex-Special Forces Vietnam Veteran by the name of John Kreese (Martin Kove), runs the dojo like a boot camp, instilling his students with a Draconian philosophy he refers to as the Way of the Fist, which emphasizes ruthlessness and ferocity. When he sees Johnny, Tommy, and Bobby among Kreese's students, he nervously leaves. While riding home that night on his bike, Johnny and his friends sideswipe Daniel on their motorbikes, causing him to fall down a hill. Daniel is mildly injured but more scared and humiliated. Arriving back at home, Lucille sees him tossing his wrecked bike in a dumpster. Daniel, angry at how his life has been disrupted with the move, tells his mother he wants to move back to New Jersey. As they walk away, Miyagi emerges from his workshop, having heard their conversation. The next day, Daniel finds his bike out of the dumpster and repaired. He goes to Miyagi's workshop and finds out that the maintenance man had repaired it for him. Miyagi is also pruning bonsai trees and invites Daniel to try it. Daniel is resistant but Miyagi convinces him that it's a relaxing hobby. Miyagi also shares some of his own personal history with Daniel: he learned about pruning bonsai trees from this father while living in his home country of Okinawa. Ali and Daniel both decorate the school gymnasium for an upcoming Halloween dance. Daniel, however, chooses not to attend; when Miyagi asks him why, Daniel says he doesn't have a costume. Miyagi also senses that Daniel lacks confidence in himself, and fashions a costume for Daniel consisting of a shower head and curtain. Daniel arrives at the school and meets with Ali, dancing briefly with her. A prankster at the dance smashes a raw egg on Daniel's head and he goes to the bathroom to clean up. Johnny is in one of the stalls, dressed like a skeleton (the other Cobra Kai are as well) and rolling marijuana joints. Daniel rigs a prank, dangling a hose over Johnny and turning on the water, dousing his enemy. Johnny rushes out of the bathroom after Daniel. Ali briefly stalls them by tripping Johnny and spilling all the other Cobra Kais to the floor. Daniel rushes out of the school and nearly makes it over the fence at his home when the Kais catch him and begin to beat him seriously. Yelling about how enemies deserve "no mercy", Johnny winds up for a brutal kick and misses when Miyagi appears and pushes Daniel out of the way. The Kais attack Miyagi, who easily defeats them, including Johnny. Leaving them all on the ground and writhing in pain, Miyagi takes Daniel to his workshop and places a medicinal bandanna on his head and gives him strong tea to drink. Daniel is amazed that an older man is skilled in karate and asks Miyagi to teach him. Miyagi mentions that the Kais' problem is not their own doing but must be their teacher's. Miyagi suggests that Daniel talk to their teacher; Daniel refuses, thinking he'll be beaten again. Miyagi is reluctant to get involved but agrees to teach Daniel and also agrees to go with him to the Kais dojo and speak with their instructor. At the Cobra Kai dojo the next day, Daniel and Miyagi watch as Kreese lectures his students that an opponent is also the enemy and deserves no mercy. When Johnny notices that Daniel and Miyagi are in the room, Kreese interrupts his class and confronts the visitors. Kreese scornfully dismisses Miyagi's request that his students leave Daniel alone and orders Daniel to fight Johnny immediately. Miyagi wants the odds to be more even for Daniel and suggests that Daniel and the Kais match up at the All-Valley Karate tournament a few weeks from then. Kreese likes the challenge and agrees. He also agrees to order his students not to touch Daniel until then. Miyagi takes Daniel to his home to begin his training. Out in front of the house are a dozen classic American cars. Miyagi tells Daniel that they'll have to make a pact: Miyagi will instruct Daniel and his student will not question his method. When Daniel agrees, Miyagi hands Daniel a sponge and orders him to wash and wax all the cars. Miyagi's instructions are very specific; Daniel will only use the sponge and waxing cloths by moving his hands and arms in wide circles. He will also breathe deeply, in through his nose & out through his mouth. In the weeks that follow, Miyagi gives Daniel further chores to complete with similar instructions on technique: sanding a walkway that leads around Miyagi's backyard (landscaped to be a Japanese garden), staining the fence that surrounds his property and painting his house. With each new chore, Daniel's frustration grows at the seeming lack of any karate training and Miyagi's minimal praise of his work. One night, after finishing the painting of Miyagi's house, Daniel expresses his frustration to his teacher. Miyagi tells Daniel to show him how he washed and polished the cars. When Daniel tells him his shoulder aches too much, Miyagi uses acupressure to relieve the tension and orders Daniel to show him the motions he'd been using to do the chores. Daniel quickly realizes that the chores (which are essentially Daniel's "fee" for the lessons) were also practice for defensive moves, exercises to build muscle tone, his reflexes and proper breathing technique. After a few minutes of practice, Miyagi suddenly yells and throws several punches and kicks at Daniel, all of which Daniel blocks easily. Miyagi also shows Daniel how to bow to his opponent, making sure Daniel looks his opponent in the eye, both for defense and to convey respect. Daniel goes on his first official date with Ali. When he arrives, driven by Lucille, at Ali's house, he finds that her parents are quite wealthy and live in Beverly Hills. Daniel is incredibly nervous and embarrassed, especially when Lucille's car stalls and they have to push-start it. However, the date with Ali is enjoyable and his embarrassment melts. 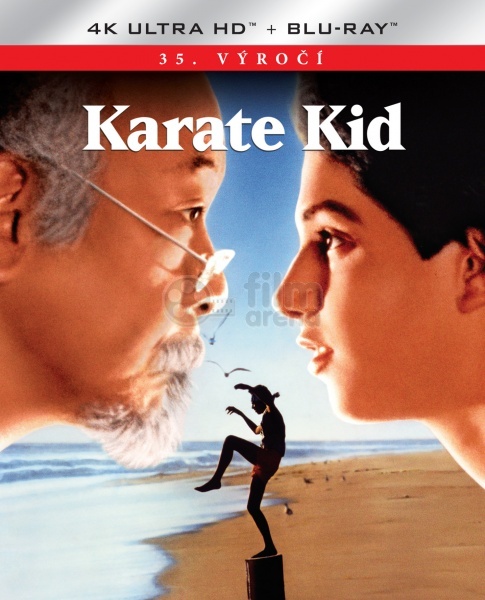 In the weeks that follow, Miyagi has Daniel work on his defensive techniques and learn physical balance by standing in a rowboat and trying to stay upright in the surf of the ocean. When Daniel comes out of the water, he sees Miyagi standing on a post down the beach. Miyagi is practicing a move where he lifts his arms and one leg, but kicks with the other. When Daniel asks him what the move is Miyagi calls it the "crane technique" saying that if it's performed properly, an opponent will have no defense. Back at Miyagi's pickup truck, there are a couple of drunken men who have placed their empty beer bottles on the fender. Miyagi politely asks them to take them off. When the men refuse and insult Miyagi's Japanese heritage, Miyagi suddenly chops the tops of the bottles with a slice of his bare hand. The men quickly remove the bottles. Ali asks Daniel to meet her for another date. Daniel goes to Ali's parents club where he sees Ali dancing with Johnny. When Johnny spots Daniel, he forces Ali to kiss him. Daniel, ashamed, goes to leave and runs into a waiter, who spills a tray of food on him, drawing laughter from everyone who sees the accident. Ali, furious, slaps Johnny and leaves, which Daniel does not see happen. Later that night, at Miyagi's house, Daniel finds him drunk and dressed in an Army sergeant's uniform. Miyagi shows Daniel a picture of his late wife and has Daniel drink a toast with him. After a few minutes, Miyagi passes out in his bed and Daniel covers him with a blanket. Daniel finds an Army document stating that Miyagi's wife and child had died during birth at the Manzanar relocation camp for Japanese Americans in California. Daniel also discovers that Miyagi is a war hero, having been awarded the Congressional Medal of Honor. Before leaving, Daniel bows to his teacher. More time passes and Daniel continues to train, often alone. He also practices Miyagi's crane kick at the beach. Miyagi also teaches Daniel how to punch, harshly reprimanding Daniel when the boy begins to goof off. Daniel's 16th birthday comes around and he has cake and ice cream with Miyagi. He has also passed his driver's test. Miyagi gives Daniel a Japanese robe with an embroidered bonsai tree sewn into the back. Miyagi's other present is one of the cars he had Daniel wash and wax, a yellow 1948 Ford Super Deluxe. He tells Daniel to go out and find the "balance" in his life; realizing that he has confidence and to pursue his relationship with Ali. Daniel drives to a local hangout and finds Ali, intending to confront her about kissing Johnny. She mostly ignores him until Ali's friend Susan explains that Johnny had kissed her only to humiliate Daniel and that Ali had hurt her wrist while hitting Johnny. Daniel apologizes to Ali and she accepts. He takes her out for a drive in his new car. On the day of the tournament, Ali and Lucille join him. At the registration desk the official asks what degree of belt Daniel has attained. Miyagi tells the official that Daniel is a black belt and slyly steals the official's belt from his back, giving it to Ali. In the locker room while dressing, Daniel is confronted by some of the Cobra Kais led by Dutch, one of Kreese's top-ranking students,. One of the referees orders the Kais out. In the tourney ring, Daniel squares off and beats his first opponent. He continues to advance, much to his own surprise. In the higher rounds, Daniel faces off against some of the Cobra Kais. When Daniel defeats Tommy and Dutch, Kreese orders Bobby to use an illegal kick to deliberately injure Daniel's knee, taking him out of the competition. Though disgusted, Bobby complies, severely injuring Daniel and getting disqualified in the process. Daniel is taken to the locker room where a medic tells him he won't be able to finish the competition. Daniel is devastated, but Ali, Lucille, and Miyagi all tell him that he made his point, and further fighting isn't necessary. However, after both women have left, Daniel asks Miyagi to use acupressure to fix his knee. Though Miyagi initially reiterates Lucille's comments that Daniel has nothing left to prove, Daniel insists he will never be able to achieve his life's balance if he knows his tormentors have gotten the best of him. Miyagi agrees and partially heals Daniel's leg. Daniel returns to the ring moments before Johnny is about to be named winner by default. Needing three contact points to win, both square off and after several tense rounds the score is tied at two each. Daniel tries a high kick which is caught by Johnny, who, under orders from Kreese, plants an elbow in Daniel's injured knee. Daniel, despite being in pain, is undeterred and lines up for the final round. He takes up the crane technique pose and with an approving look from Miyagi, waits for Johnny to make his move. Daniel kicks out with his leg and connects with Johnny's chin, scoring a third point and winning the match and title. As he's carried around on the shoulders of the other competitors, Johnny congratulates him and hands him the championship trophy. Daniel celebrates his triumph and sees Miyagi nearby smiling.